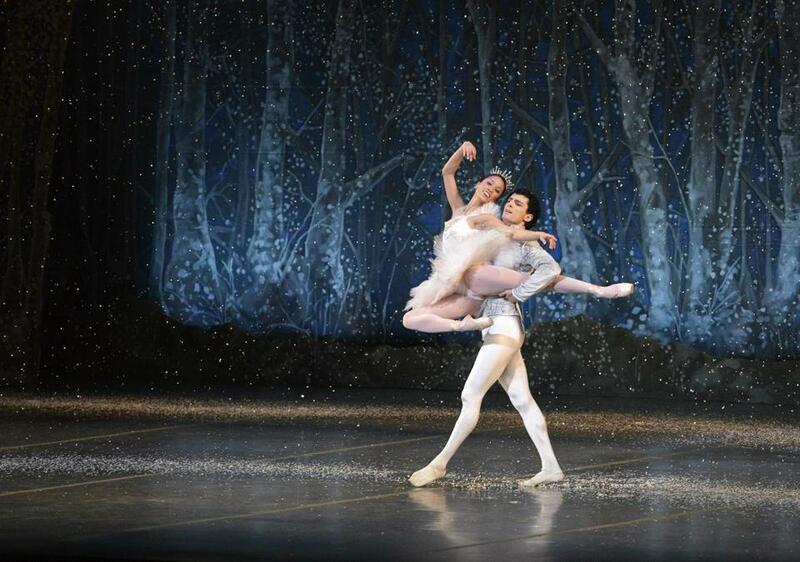 Lia Cirio and Lasha Khozashvili in dress rehearsal for Boston Ballet’s “The Nutcracker” at the Boston Opera House. Tchaikovsky’s Overture to “The Nutcracker” is such a powerful scene setter that it’s odd, and refreshing, to see characters from the ballet appear on stage before the music even begins. At the outset of Boston Ballet’s production, a pair of street urchins seat themselves under a panel. Then Clara strolls by in a pale blue Empire-waisted coat and matching bonnet, looking like a very young Jane Austen. Well, new as of last year, when artistic director Mikko Nissinen decided it was time for a fresh approach. Designer Robert Perdziola pushed the time period of the production back about 20 years, from 1840 to 1820, close to when E. T. A. Hoffmann wrote the novella, “Nutcracker and Mouse King,” on which the ballet is based. The party ladies now wear Empire-waisted muslin dresses and their husbands’ frock coats; the children are in miniature versions. The Silberhaus drawing room is a sumptuous brown; the traditional firs of the “Snow” scene have been replaced by a beautiful forest of birches. And the palace of the Nutcracker Prince and the Sugar Plum Fairy looks less like cotton candy and more like the ballroom of Louis XIV, France’s Sun King, with Fragonard-like depictions of the second-act divertissements and famous figures from the history of dance on the ceiling. At times it’s almost too adult. The Red Cross stretcher is gone from the battle scene; so is the baby mice’s parody of the Dance of the Cygnets in “Swan Lake,” and the owl clock from which Drosselmeier used to emerge. Some ideas work, like having Clara’s parents give her toe shoes rather than a doll, and having her use the nutcracker to shell nuts for her guests. Some are puzzling: Fritz seems way too old to be getting a floppy stuffed bunny, which he hates. (The bunny, grown to life size, does turn up in the battle scene to rescue a gingerbread man, but he looks out of place there, too.) And the balloon in which Clara and the Nutcracker Prince arrive in his kingdom has become a unattractively dark snow cloud. At times, too, the sets and the second-act costumes seem over-subtle. Designs that shimmer close up can appear muddy from even a few rows back. And some of the ladies’ costumes are not flattering. There is, on the other hand, a lot of detail to be appreciated on repeated viewings, like the ship at Drosselmei-er’s shop that reappears, life size, to take Clara away from the mice. The 43 performances of “The Nutcracker” at the Opera House this holiday season feature a number of different casts. The one the company presented opening night Friday was absolutely first-rate, starting with the Clara, Eliza French, one of the more graceful and self-composed young ladies I’ve seen in the role over the past 28 years. As the Sugar Plum Fairy and the Nutcracker Prince, Misa Kuranaga and Jeffrey Cirio were like Clara’s dolls come to vivid life, playful and teasing and in total command of the steps. Ashley Ellis brought poetry to Dew Drop, Lia Cirio a pleasing spontaneity to the Snow Queen. Isaac Akiba was the pyrotechnic standout, with big split jumps and blazing tours à la seconde. New principal Petra Conti was sinuous in Arabian; Irlan Silva was a jumping jack of a Harlequin; Whitney Jensen’s Ballerina was appropriately over the top. Sarah Wroth gave her usual warmth and energy to Frau Silberhaus.